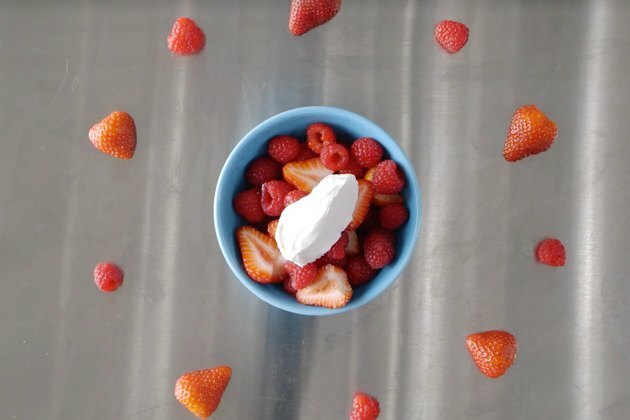 Do you adore strawberries dipped in whipped cream, but you can’t deal with all that sugar and dairy? We have the answer. This variation on traditional whipped cream is made with just two ingredients: coconut cream from a can and vanilla extract, which means it has no dairy and no added sugar. At under 150 calories per serving, there’s no reason not to top your desserts with this creamy treat. You'll want to chill a can of coconut cream asap! Making the whipped topping is as easy as chilling the coconut cream, adding the vanilla and whipping it until it’s light and fluffy. You’ll want to dollop this heavenly cream on vegan and nondairy desserts — or any dessert, for that matter. We think it’d go great with these sea salt and sweet potato brownies or this cherry-mango crumble. One-third cup of coconut of whipped cream provides 0.89 grams of protein, 0.98 grams of sugar, 15.03 grams of total fat and 1.86 grams of total carbohydrates. Do you love dairy-free desserts? Are you going to try this recipe, or have you already tried it? If so, do you have any suggestions or comments? Share your thoughts!